Even though I get melancholy when the season changes from summer to fall, and even more so when it changes from fall to winter, I have to admit that I really do love the return to interiority. I just read a piece in Elephant Journal by a woman who went to a retreat at Kripalu and decided that she didn’t want to be alone with her “Self” after all. That’s not me. Not at all. Me? I need solitude, a strong daily dose of it. When I am too much the “social butterfly” I become lost and scattered and my “self” starts pixelating beyond recognition. This has made me think about what conditions I need, and to try to actively create them. Do you know what conditions make you feel like you are living like your True Self? As a result of reading this, I have instituted a new morning routine. I now get up a little earlier and make myself a cup of decaf . 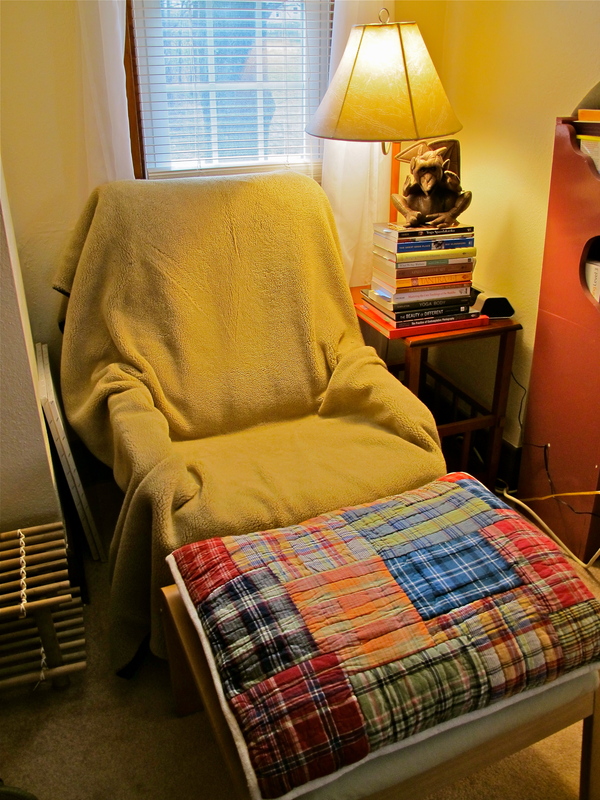 But instead of sitting down at the computer and checking email and Facebook, which was my usual habit, I now take my cup up to my Space Chair, turn on the little heater, and settle in with my book for an hour. I can’t tell you how cozy and delightful this is! It seems like I’ve been whining forever about how I need more time to read, and here it is. Now, instead of leaving my book to the end of the day, when I am toast, I am reading in the front part of the day, when I am rested, alert and receptive. After an hour’s read, I go and make myself some amaranth cereal and bring it back up into my cozy lair and start alternately scribbling in my journal and shoveling cereal into my mouth. When another hour has passed, I am good to go: ready to be physically active and socially engaged. These may not be all my “conditions” but they are certainly key: solitude, reading, and writing. Do you know what yours are? Care to share?